Ballmoss, photographed at Grassy Waters Preserve, West Palm Beach, Palm Beach County, in February 2016. Most of Florida's 16 native bromeliads are listed as either threatened or endangered. Ballmoss, Tillandsia Recurvata, isn't one of them. In fact, we'd say it's a tossup between ballmoss and Spanish moss for the distinction of being the most common bromeliad in the state. Ballmoss is everywhere, in trees, in shrubs. Take a close look at those small tangles on power lines and telephone lines. Yep. Ballmoss. Like Spanish moss, ballmoss isn't a moss at all but a cousin to the pineapple. 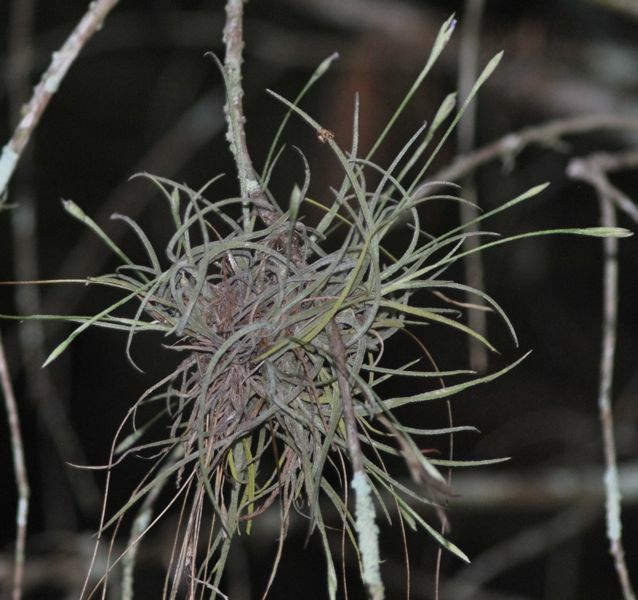 It grows on other plants, but it is an epiphyte, an air plant, rather than a parasite. It uses the host for support, as a place to grow but it doesn't steal anything, or inhibit its growth in any way. Live oaks are particular favorites. Ballmoss often is found growing on dead branches but the presence of ballmoss has nothing to do with the limb's demise. As noted above, the "host" doesn't have to be a living thing. Ballmoss looks like greenish-white tangle about four to six inches in diamter. Its leaves are relatively long, narrow and curved. 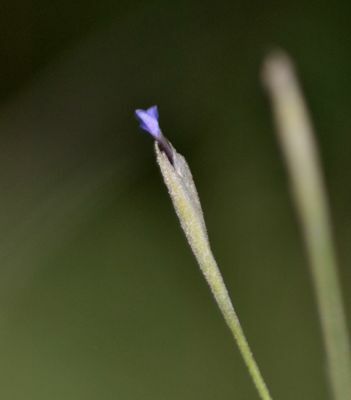 It's flowers are tiny, violet or blue, atop long stalks (see the photo below). It flowers spring to fall, producing capsules full of tiny cotton-like seeds, which get dispersed by wind. Ballmoss is a Florida native and a perennial. 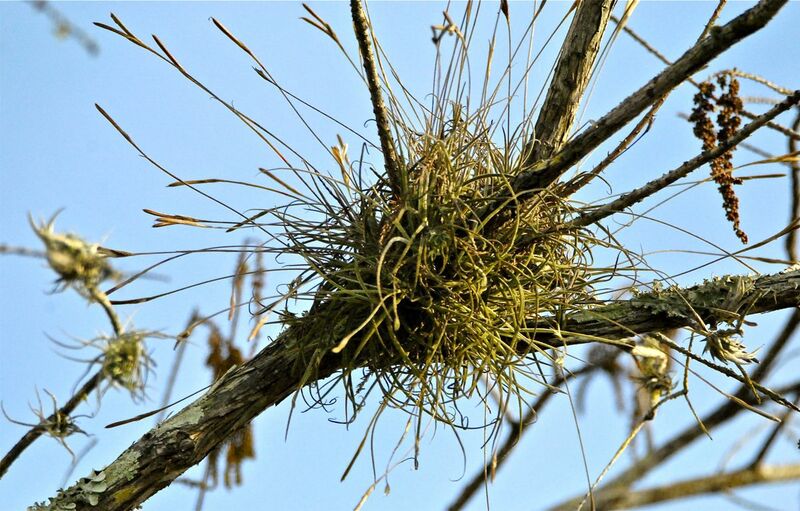 Like all epiphytes, ballmoss gets water and nutrients from the air. Many epiphytes have "tanks," places where water and dirt collect, but ballmoss doesn't. It grows in moist places, like forests and swamps, absorbing what it needs through stem and leaves. Ballmoss doesn't have roots. United States Department of Agriculture distribution maps show ballmoss growing in all of the Peninsula and a few Panhandle counties. However, the University of Florida says it can be found in all of the state's 67 counties. It's also found in a couple of counties in southeastern Georgia (that state lists ballmoss as threatened), in Texas, New Mexico and Arizona. It's also found in the Caribbean, Mexico, Central America and South America to Argentina and Chile. In traditional medicine, ballmoss has been used to make medicines for a number of conditions. In Argentina, it's been used to treat hemmorhoids. In Curacao, it's been used to treat certain vaginal discharges and gallbladder problems and to stimulate menstrual flow. It is a cultivated plant, grown either by seed or by division. It is drought tolerant and requires little care once established. Ballmoss is a member of Bromeliaceae, the bromeliad family. Other names and spellings include ball-moss and bunchmoss.